As I continue running and training for races, I wanted to start having better accuracy than the Nike+ I had been using to train over the previous year. Since the sportwatch was adding extra distance to my runs and I didn’t want to run with my phone, so a GPS watch was my best bet. Having already tracked my training with the Nike Plus for the past year, I decided to try the Nike+ Sportwatch GPS. 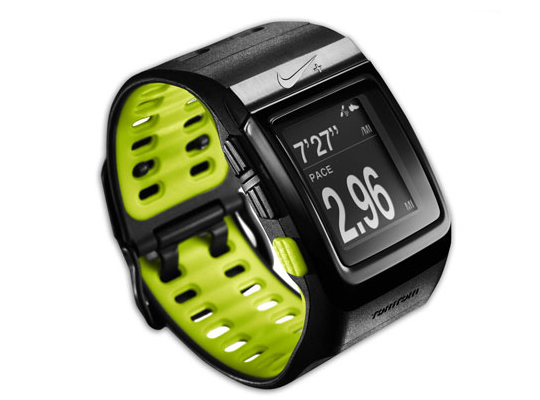 The Nike+ Sportwatch GPS was as easy to set up as the regular Nike+ Sportwatch. Just install the software from nikeplus.com, plug it into my MacBook Pro, and the rest is just following onscreen prompts. Connecting the watch to the Nike+ transmitter already implanted in the sole of my sneaker was a easily done with a few button presses before my first run. When it’s time to run, holding down the green button starts the run and it connects to the GPS satellites via a TomTom receiver and to Nike+ sensor in the shoe, in case it loses GPS signal. Most of the time, I have no problem connecting to both, but sometimes I need to get away from buildings for it to connect. Once connection is made and the run is started, the information is split into two parts. The lower part of the screen shows a preset running variable and the top part can be cycled through distance, pace, time elapsed, time, calories burned and heart rate (if wearing a heart rate monitor). The screen is easy to read and has a backlight that is activated when tapping the screen. Tapping it a second time will mark a lap. After the run, plugging the watch into the computer will automatically upload the run and display it on the Nike+ website. Once it is uploaded, it displays statistics about the run and allows the user to compare it to previous runs and view the run on a Google map that is generated based on the GPS data from the phone. My only real problem with the Nike+ Sportwatch GPS is the Nike+ website. It’s hard to navigate and tends to have issues logging in, remembering my information and other assorted annoyances. One thing I did notice, for those few occasions when the sportwatch could not communicate with the GPS satellites, and I ran with the Nike+ sensor, the sensor was more accurate than it had been with the Nike+ sportwatch. It was nice to know I was getting a more accurate run with or without the TomTom satellite receiver. Although I have never used a GPS watch before, I really like the Nike+ Sportwatch GPS. I like having more accurate statistics about my runs and it helps me train better. It’s getting me to run longer distances than I had with the previous sportwatch thanks to the improved distance measurement. As I run more and train for my races, it’s an additional weapon in my running arsenal.